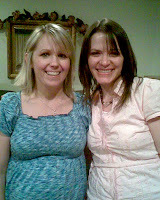 Gail Saxon from my old ward in Louisiana (one of my former youth leaders), threw me a baby shower when we were there. It was awesome! So many of my old youth leaders and teachers were there as well as friends that I grew up with. This is my best friend since the 5th grade, Toni. She's cute and pregnant with her 3rd and she's gonna kill me for putting this picture up. I took it with my phone so it's not the best picture anyway. And here's a link to her blog where she posted more pictures of the shower. Check it out! Thanks Gail and all the women who helped put it together, it was beautiful! It was so nice to be around so many people I love. I hate that I missed your shower but I'm so glad we still were able to hang out. Maybe it won't be another 3 years until you come down again! OK, If you know I am going to kill you, why do you do it anyway!!!!!! To Toni: Because... I just had to. I was willing to take that risk. To Robin: It definately won't be 3 yrs again. I'm gonna try to come down for joe's wedding (july 26th).